High Tunnel Farmer-to-Farmer Meeting : Spotted Wing Drosophila Latest information from the NYS IPM Program. 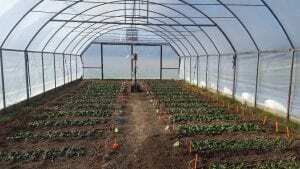 High tunnel enclosed in plastic with end doors in place. Join us for a facilitated farmer to farmer style workshop focused on high tunnel production and management. The final meeting agenda will be developed on the day of the meeting with input from attendees! We plan to cover such topics as season long soil fertility management, high tunnel model selection and construction considerations, biological pest and disease management, and more.